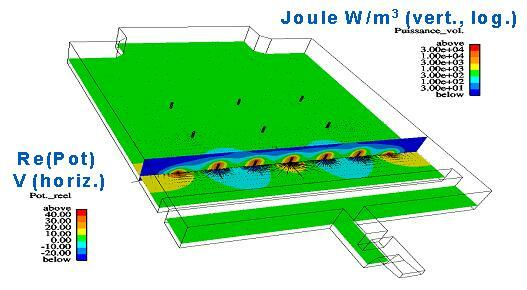 This module is dedicated to Joule effect and electric arc modeling. Joule effect option has been extended to solve a complex potential for the treatment of tri-phase alternating current and to account for offset effect. Electric arc module includes both Joule effect and electromagnetic forces modeling which could induce flow, and 3D unsteady movement of the arc. 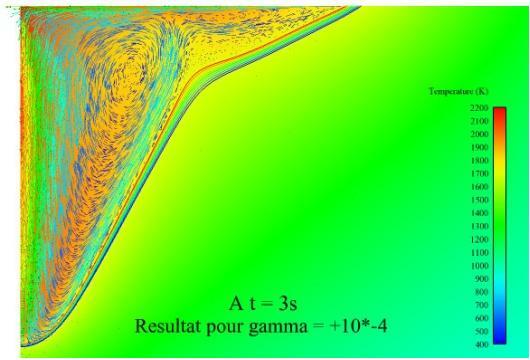 Calculations were made by a PhD Student sponsored by EDF and ONERA (french aerospace laboratory), showing the first twenty milliseconds of arc lightning interaction with aircraft material. The electric current is set at 200 A. The color coding corresponds to 3 isothermal plasma. This model uses a mesh containing approximately 1 million cells. Multi-physics modeling of arc welding:Numerical simulation of welding is performed including both electric arc and solid electrode and weld pool simulation.